SmoothParking is the best guide to city parking. 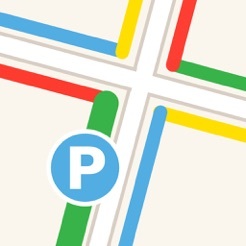 We make it easy to find street parking and save your parking spot. Just enter how long you need to park for and it will show you where you can legally park. SmoothParking has the most accurate on-street parking database, and it is the only app that takes into account parking holidays. 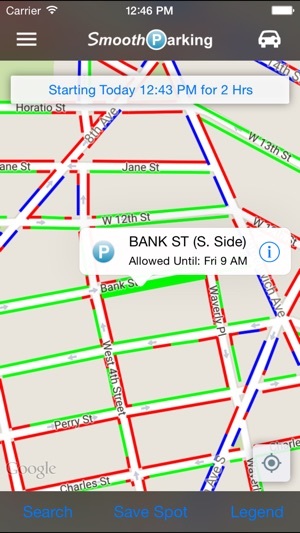 The app will even show you which spots are metered (blue lines) and which spots are about to become legal (yellow lines). If you see a yellow line you have a very good chance of finding an open spot because parking is not yet legal there. The map can rotate in the direction your car is headed, so you can easily see the parking restrictions and which side of the street they apply to. SmoothParking is the only app that can save your spot with one click and automatically find the parking restrictions for that spot. It will even notify you when the legal parking time is up. You can see your saved spot later and share the spot with a whomever you like. 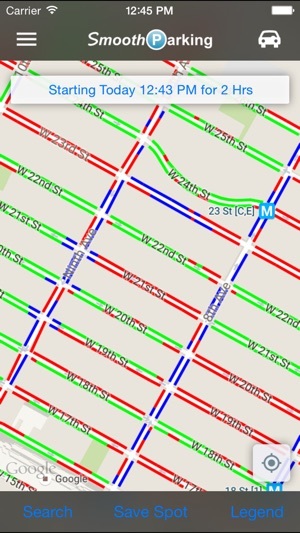 Garages have been added to the parking map in and around NYC. All of them offer a guaranteed spot for SmoothParking users. No need to make a reservation or pay in advance, we will help you get a guaranteed spot. The guarantee is solely for your benefit. The guarantee does not obligate you to go to the garage, but if you go to the garage you won’t be turned away. Currently works in New York City, Hoboken, Milwaukee, and parts of Washington D.C. with more places on the way. Available in English and Spanish. We aim to make your parking experience as smooth as possible! This app along with a list of others (Parkwhiz,Spot Angels) is absolutely needed if you have a car in NYC. It is usually spot on with regulations with alternate side parking however the "Save Spot" feature doesn't work, at least for me. With that, I use Spot Angels to remind myself where I parked and set a reminder to move before getting a ticket. Setting the park duration is a bit buggy given if you change the setting you will have to restart the app for the changes to be updated on the map. I would also like to see the GPS work better in real time if you're driving around looking for parking. Many times you have to refresh the app using the (🔽) button for the app to follow your current location. I would also like to see the getting rid of the (north compass function) and see the map move with your direction you're driving. Other than that this app is used on the daily and I highly recommend it to those who are driving in the city. The only functional alternate side parking map! This app is really good. We’ve recently moved to Manhattan from Queens, and I never thought I would say this, but parking in Queens was quite easy! Even finding spots where there are any viable parking spots is a huge problem here, and even the official DOT website doesn’t have a good map showing where you can or can’t park. Here comes this app, which judging by its looks is not updated since 2013, but it totally does the job!! It’s not perfect of course, there are minor errors here and there, but it is BY FAR the best application for ASP parking in NYC. I never review apps, but smooth parking has been so helpful. Before I go someplace, I set the start and end times to check what the parking situation will be for the extent of time I will need it. That way when I get there I can go directly to the street or parking for that length of time I need is possible without a meter. There may or may not be a spot but at least I'm not wasting my time going down streets where it wouldn't be possible at all. I rely on this app a lot and it's been really helpful.